2013 C2MTL Conference. Agnieszka, photographer. Greater Montréal was named as one of the world’s top 21 intelligent communities in 2013 but did not make it to the list of Top7 announced by the Intelligent Community Forum in January 2014. How does one become an intelligent community and what is the role of education and talent? This is the 3rd of a 4-part series. What is the role of education and talent in the development of intelligent communities? Technology is also transforming how we provide and deliver training thanks to the availability of smart devices and broadband access. For example, massive open online courses (aka MOOCs), such as edX, allow students from around the world to follow courses from participating universities, and gain credits. Another key component for attracting and maintaining a knowledge workforce is providing a quality of life and environment which is desirable to this demographic. This subject will be discussed further detail in the next article on governance. Waterloo, Ontario earned the distinction of Intelligent Community of the Year in 2007, thanks in large part to the University of Waterloo’s innovative approach to education with a focus on engineering and computer science, and close ties to industry. Not only does it allow students and faculty members to own the intellectual property rights of work they developed at the university, it also offers the largest post-secondary co-op program with over 11,000 students per year. Today, the University of Waterloo operates more than 50 research institutes, 12 federal and provincial centers of excellence, and is actively involved in community developments, such as the Research & Technology Park. Like Stanford University, it has spurred many entrepreneurial and technology spin-offs such as Research in Motion, Open Text, Teledyne DALSA, Descartes Systems, to name a few. What about education and talent in Montreal? 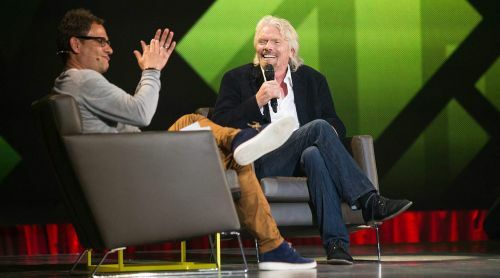 Sir Richard Branson (right) speaking at C2MTL in 2013. Jimmy Hamelin, photographer. Under the leadership of the École de Technologie Supérieure (ÉTS) and McGill University, the Quartier de l’innovation (QI), is a world-class innovation ecosystem which was officially launched in May 2013. It represents the integration of the four pillars of a creative society : art, education, industry and urban space. Created to meet the needs of innovative Montrealers, QI is international in scope. It is located in South-West Montreal, a historic area which was once known as the industrial cradle of Canada. It is now home to a dynamic artistic community and many multimedia and technology companies. QI is behind exciting projects such as C2MTL, a new kind of annual conference that explores the relationship between commerce and creativity, and its potential for redefining the business world. Montréal Digital Metropolis (MDM) is another project which will test drive QI as the first fully digital district in Montreal with top-notch access to WiFi and ultra high-speed networks. In the next post, we will examine the role of governance in the development of intelligent communities.